When we think of baby’s skin, we often think of skin that is silky, smooth, soft and flawless. Yet, some babies are not so lucky. 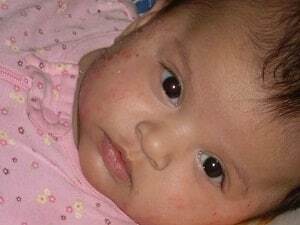 Baby eczema can leave otherwise smooth skin with dry, itchy patches. These patches can be irritating, and even painful for our little ones. If your little one develops dry, bumpy and itchy patches on their skin, it might be eczema. Eczema can be hard to get rid of once it develops, but there are solutions. 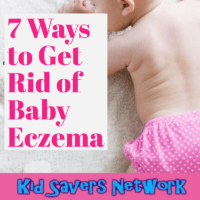 Read on to learn 7 ways to prevent and get rid of baby eczema. Discover all natural remedies that can replace the harmful steroids that doctors often prescribe. Eczema is a chronic skin condition that can affect children and adults of all ages. It causes patches of inflamed, rough, dry and itchy skin to develop. 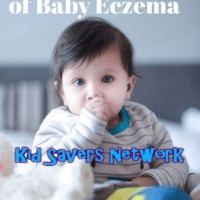 Once someone develops eczema, it can be hard to get rid of, and this is especially true for babies and children. 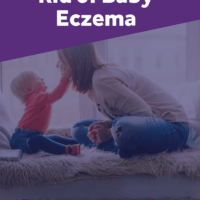 The good news is that there are ways to help reduce the symptoms of baby eczema and even natural methods for healing it. Many parents don’t realize that even a natural fragrance can be irritating to an infant’s skin. A baby’s skin can be extremely sensitive, and they can develop allergies to the simplest of things. Moreover, detergents, soaps, lotions and even baby shampoos and wipes can include harsh chemicals and dyes. Therefore, you should only be using fragrant free and dye free products on your baby. Try to find all-natural products for everyday purposes as much as possible. Don’t forget about the dyes in foods. Food dye can be just as irritating for your infant. Be sure to buy natural foods without dyes and other unnatural ingredients for your baby. Even though eczema is a topical condition, what we ingest internally can cause it. Be sure to pay attention to what foods your baby has eaten when it flares up. Keeping a food journal can help with this. After some time of doing this, you might be able to pinpoint which foods worsen your child’s symptoms. Keeping a food journal can help with this. After some time of doing this, you might be able to pinpoint which foods worsen your child’s symptoms. Be aware that many children are allergic to cow’s milk, soy and wheat. These foods can cause chronic skin ailments to flair up. You can also ask your doctor to perform an allergy test. 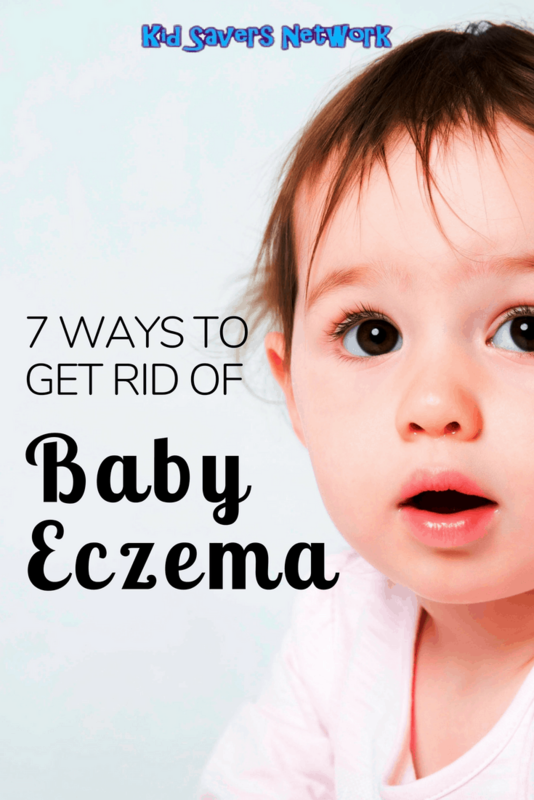 This could also help with pinpointing an allergen which is causing your baby’s eczema. Animal based fabrics, as well as other synthetic fabrics, can be irritating to your baby’s skin. Many dermatologists recommend sticking with 100% cotton clothes, swaddles, blankets and even diapers. Again, ensure that your fabric is dye free, and then wash it with a low-chemical, scent free detergent, as well. If you are breastfeeding, be sure to eat whole foods. Processed foods contain a lot of dyes and preservatives which can trigger the symptoms of eczema. Once your baby moves on from breast milk or the bottle, ensure that she’s eating whole foods as much as possible, as well. Eating a diet rich in whole foods will result in your body functioning at its best. Whole foods boost your immune system and are beneficial for gut health too. This goes without saying, but you might be surprised at how fast your baby’s skin can dry out. Especially eczema prone skin. Plus, moisturizing often can aid in itch relief which your baby will thank you for. Be aware, however, that many moisturizers contain dyes and fragrances. Therefore, it is important to go natural. Also, avoid mineral oils and baby oils, as they are made from petrochemical byproducts. Instead, try coconut oil or a natural vegetable oil. Keep your baby’s skin uncovered, or loosely covered as much as possible. Even the slightest overheating can provoke a rash to develop. Keep your baby away from direct sunlight if they have eczema prone skin. Oatmeal can help alleviate itching and reduce inflammation. To make an oatmeal bath, simply blend about a ½ cup of oats in a blender until you have a fine powder of oats. Then, sprinkle the oat powder into your baby’s bath water and stir until the water has a silky feel to it. Let your little one soak in it for about 20 minutes. Here is a great video for more info! 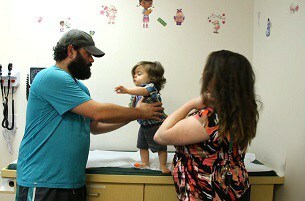 Dry air can cause a number of issues for infants, including eczema. Use a humidifier to moisten the air in your baby’s room when she is napping and sleeping for the night. As previously mentioned, coconut oil is wonderful for your baby’s skin. Furthermore, it has natural healing, antioxidant, anti-inflammatory and healing properties. Coconut oil absorbs at a slower rate than other vegetable oils, so this makes it an excellent oil for maintaining moisturized skin for a longer period of time. Aloe vera gel is a rich healing and anti-inflammatory agent. Aloe also applies a cooling sensation to the skin. You can buy pure aloe vera gel online or even grow an aloe vera plant and use the gel straight from the plant. Mix baking soda with water to make a paste. Apply the paste to irritated skin. Baking soda paste will cool and protect the skin. 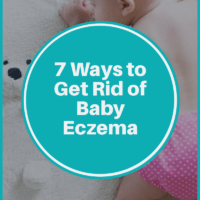 It can also stop the itching and allow your baby’s skin to heal. 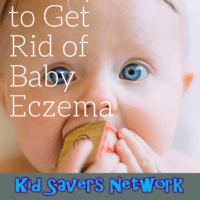 Trying to control and get rid of baby eczema can be incredibly frustrating. 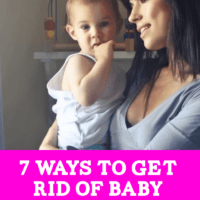 Remember these tips and try the natural remedies to see what works best for your baby.